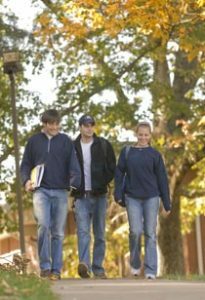 An education at Reinhardt University is financed by three major sources of income: tuition, endowment and unrestricted gifts. Unrestricted gifts make up the difference between the actual cost of educating students and the amount the College can guarantee in tuition and endowment. While unrestricted funds are essential for providing the quality of education that has always been a tradition at Reinhardt, you may also choose to direct your gift for a specific purpose by establishing an endowed fund that will benefit students for generations to come. After reaching a designated level, earnings from the endowment will be used to fund scholarships and other programs. In order to provide funds for major projects, the Advancement Staff seeks donors and foundations who are interested in supporting large undertakings of the College. All the projects were primarily funded by donations from individuals and foundations. It is only through the generosity of friends, alumni, parents and foundations that the College is able to continue our tradition of providing a quality education in an environment of Christian caring. There are many ways to Make Your Gift Today to Reinhardt University, including our newest option over this secured website. You may make your gift by credit card, check, money order, or even by giving appreciated stock or other real property. Simply choose the method that best suits your needs. Reinhardt University uses a third-party vendor to secure your online credit card gift. Your gift will be processed immediately and you will receive email confirmation of your donation. Click below to make your gift online. Also, watch your mailbox for updates, magazines and other information that include a postage-paid envelope to send Reinhardt your gift! Not receiving mail from Reinhardt? Update your information! If you would like to speak to a representative from the Office of Annual Giving about a gift or pledge, please call us weekdays between 8:30 a.m. and 5:00 p.m. eastern standard time at 770-720-5507. Reinhardt University willingly accepts gifts of appreciated securities held by a bank or a broker. If you are interested in making a gift of stock to Reinhardt University, please notify us in advance of making your gift. This notice is important so that we can provide proper credit and timely acknowledgement of your donation. Either you or your broker should contact Tim Norton, Vice President for Advancement & Marketing at (770) 720-5545 or by email to TAN@reinhardt.edu for instructions on how to complete a stock transfer. You can support Reinhardt's tradition of excellence. Giving to Reinhardt is a way to show your belief in the power of a Reinhardt education and in the promise of students, present and future. Not only will you realize your philanthropic goals, your gift to the University can also benefit your family and estate. There are several ways you can support Reinhardt University and receive significant tax and financial benefits. Bequest — Name Reinhardt University in your will or trust, benefit your favorite office or area on campus, and you may save on your estate taxes. Life Income Arrangement — Receive an income stream for life and an immediate charitable deduction. Charitable Lead Trust — Preserve your assets for your children, grandchildren, or others and provide support to Reinhardt University. Retirement Plan Assets — Because these assets are subject to both income and estate taxation, they make a wise planned gift choice. Reinhardt Legacy Society — Become an inaugural member of the Reinhardt Legacy Society. Let us know you have made provisions in your will for 5 % of your Estate to benefit Reinhardt. You will be recognized at all Legacy Society events. For more information, contact the Advancement Office: 770-720-5545. Life Insurance — This is an affordable way to make a significant gift to Reinhardt. To learn more about how you can support Reinhardt's legacy, please contact the Office of Advancement at 770-720-5545. We'll be happy to work with you and your advisors to design a planned giving opportunity that meets your needs. Your generosity will enable Reinhardt to offer students an extraordinary and unforgettable liberal arts education. Gifts of Real Estate are very useful to the College, however each gift is considered on a case by case basis. In most instances, property, depending on the location, will be liquidated and the resulting funds used for the donor specified purpose or endowment. There are also several instances where, after donation of property to the College, the donor may retain a life interest in the donation. The donor is responsible for obtaining an appraisal of the property. Prior to presentation to the Buildings & Grounds Committee, a member of the advancement/development staff (or a designated Real Estate broker) must conduct a visual inspection of the property. Copy of the deed, with evidence that no liens or restrictions exist on the title of the property. Gifts of Real Estate which have an attached maintenance fee or other monthly charge are not usually accepted by the College. Examples are recreational property lots and/or parcels of land which are subject to landowners/association restrictions. Gifts of dwellings that are accepted and moved to the College for permanent display or use are generally only approved with the following provisions: 1) the cost of dismantling, moving and reinstating the dwelling or structure must be borne by the donor. 2) The cost of upkeep, maintenance, utility and other prospective costs will be covered by an endowment from which the estimated general income is 5% per annum. Example: A $1M endowment would generate $50,000 annual income for maintenance and other costs. Additionally, other gifts, such as fine art or other tangible properties can be donated to the College. Depending on the item, these gifts will either become part of the College's permanent collection or be auctioned to realize the capital needed to accomplish the donor's goal. Reinhardt has, through the generosity of many donors, amassed a substantial collection of paintings, sculpture and other valuable artifacts documenting the history of the area. If interested in speaking with someone about this category, please call the Office of Advancement : 770-720-5545 and we will be happy to discuss the options. The faculty, staff member, or affiliate of Reinhardt University should obtain a Gift in Kind Transmittal Form and a Deed of Gift Form for completion. The Deed of Gift Form is to be completed and signed by the donor. The Gift in Kind Transmittal Form is to be completed by the Reinhardt employee or affiliate who is accepting the gift on our behalf. Both forms must be submitted together to the Office of Institutional Advancement. Failure to complete and submit both forms can result in delayed acknowledgements and a deterioration of donor confidence, therefore everyone's cooperation in the timely submission of these materials is greatly appreciated. The Arts and Humanities fund is a discretionary fund for use by the Dean of the School of Arts and Humanities to enhance the programs in this area. The ASO fund, or Academic Support Office fund, provides scholarships to students who have a financial need and are in the ASO program. The ASO program provides supplementary instructional assistance to students with specific learning disabilities and/or Attention Deficit Disorders. The athletics fund is a discretionary fund in support of Reinhardt Athletic Programs administered by the Athletic Director. The Business Fund is a discretionary fund for use by the Dean of the McCamish School of Business to enhance the programs in this area. The Campus Ministry Fund is a discretionary fund for use by the Campus Chaplain. The Music fund is a discretionary fund for use by the Dean of the School of Performing Arts to enhance the programs in this area. The Education Fund is a discretionary fund for use by the Dean of the Price School of Education to enhance the programs in this area. The Falany Performing Arts Center fund supports performing arts programs at Reinhardt. The Funk Heritage Center fund provides support to promote the understanding of Native American history and the pioneer experience in the Appalachians through a history museum and Appalachian Settlers village. The Library Enhancement fund is a discretionary fund to provide for the expansion of library collections, furnishings, and computer technology. The Math and Science fund is a discretionary fund for use by the Dean of the School of Math and Science to enhance the programs in this area. The Student Activities fund is a discretionary fund for use by the Assistant Dean for Students and Director of Student Activities in the sponsorship of activities conducted by the Dudley L. Moore Jr. Office of Student Activities. An endowment establishes a permanent fund which provides perpetual, annual support for Reinhardt University. Your gift to establish an endowment creates a lasting legacy in your name or in the name of someone you wish to honor or memorialize. Your endowment benefits a Reinhardt priority of your choice, or you may give the College discretion to apply the payout from your gift to one of its highest priorities. Your endowment will be used for the purpose that you designate, consistent with College policies. The minimum amount to establish a named endowment fund is $25,000. Scholarships help Reinhardt attract and retain high-ability students, student-athletes and students who might not otherwise have the opportunity to attend college. Examples include merit scholarships, need-based scholarships and athletic or choral scholarships. These endowments enhance Reinhardt's ability to attract and retain the excellent faculty and staff who are at the core of the College's mission. Examples include Endowed Chairs, Distinguished Professorships, Distinguished Lectureships and Research Funds. These endowments allow funds to be applied to the College's highest priorities, as outlined in the strategic plan. They may be targeted at specific areas to the College to support key strategic priorities in that area. If you are interested in making a gift to Reinhardt University's endowment, please contact Tim Norton, Vice President for Advancement & Marketing, at (770) 720-5545 or by email to TAN@reinhardt.edu. Amazon is one of the most widely used websites in the world. Customers can elect to donate 0.5% of their purchase to the charity of their choice. This is all made possible by shopping on smile.amazon.com. If you already shop on Amazon, or if you’re looking for the perfect gift for a loved one, we invite you to shop at smile.amazon.com and choose Reinhardt University as your charity of choice. Below you can read about how to use Amazon Smile. At this point if you have an Amazon login, log in. If you don't have an Amazon login, click on "Create an Account". Whenever you see the "Supporting: Reinhardt University" that is all you have to do. 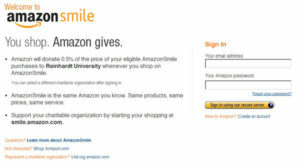 The first time you login to Amazon Smile, you will be given an opportunity to add an Amazon Smile link to your browser, then all you have to do from then on is click on that icon to shop at Amazon and Amazon will donate money to Reinhardt University.